Tickets to Approaching Empty at the Kiln Theatre are on sale now! 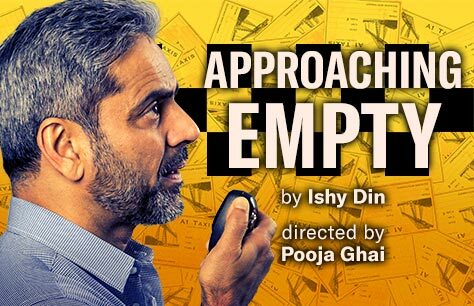 Written by Snookered writer Ishy Din and directed by Pooja Ghai, this all-new play is already receiving rave reviews for its compelling script! Don’t miss the London Kiln Theatre premiere of Approaching Empty this winter! Indian-British playwright Ishy Din is back with a brand-new play for the London theatre stage! The award-winning playwright and former Writer in Residence at the Manchester Royal Exchange is perhaps best known for authoring his debut semi-autobiographical play, Snookered, which won the award for Best New Play at the 2013 Manchester Theatre Awards. All friendships aside, Mansha means business! In a shabby minicab office in Northern England, Mansha decides to forge his own path in life, offering to buy out the business from his best mate, Raf. But the company has some dirty secrets that begin to unravel before Mansha’s very eyes and soon these two men are forced to overcome the many difficulties of running a business with their closest pals. Taking place amongst a post-industrial generation shortly after Margaret Thatcher’s death, this gripping new drama by award-winning playwright Ishy Din will capture your heart and soul! Approaching Empty stars Kammy Darweish as Mansha, Karan Gill as Shazad, Nicholas Khan as Raf, Rina Fatania as Sameena, Nicholas Prasad as Sully and Maanuv Thiara as Tany. It features direction by Pooja Ghai, design by Rosa Maggiora, lighting by David Plater and compositions and sound design by Arun Ghosh. Approaching Empty is approaching the Kiln Theatre in London this January. This extraordinary new play will have you on the edge of your seat from start to finish! Book your Approaching Empty tickets now and guarantee the best seats in the house!